Refreshing smoothies one dayâ€¦hot tea the next. It’s San Francisco, after all, so sundresses and icy drinks enjoy but brief moments of glory. As much as I reveled in salads last week, I’m baking this week to keep our kitchen warm. All that exuberant sunshine encouraged my little pot of thyme to bolt and bloom. Usually, I snip a sprig here and there, but faced with a sudden bounty, I needed to figure out how to use it all up. I found lovely photos of sugared thyme, with detailed instructions on brushing each sprig with a thin layer of egg white, sprinkling with granulated sugar, and then baking lots of cupcakes for something worthy to garnish. Tempting, yes. Realistic, no. I already have an entire shelf of flavored vinegars, several old enough to sport their own layers of mother, so that easy solution to excess herbs was out of the question. 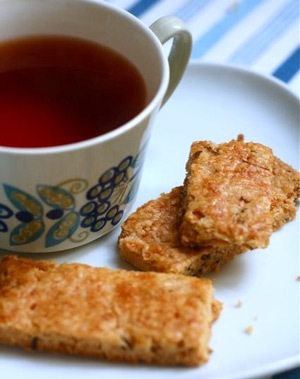 Fortunately my old, one-bowl standby — shortbread cookies — came to the rescue. I’d made a batch earlier for Robynn’s 35th birthday (get it, sweet thyme? Yeah, I had to explain it to her, too.) But as with many things we give away, we often forget to save enough goodness for ourselves. These cookies are staying in my own kitchen, enough of them for me to sweeten my afternoon teaâ€¦until the next heat wave arrives. I actually don’t like my own sweets that sweet, so the amount of sugar in this recipe is low. If you prefer, increase the measure of sugar to 1/2 cup. 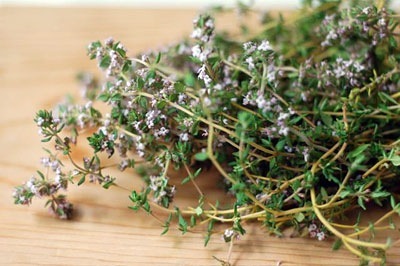 Have fun experimenting with other herbs or spices, such as rosemary, sage, cinnamon, cardamom, or saffron. If you don’t have long-grain rice flour (don’t use the glutinous kind!) then simply omit and use 2 cups of all-purpose flour. Makes about 36 shortbread bars. Preheat oven to 375 degrees F. and line a 13Ã—9-inch sheet pan with parchment. Stir together the flour, sugar, and salt. With a fork, cut the butter into the flour mixture just until the dough comes together. 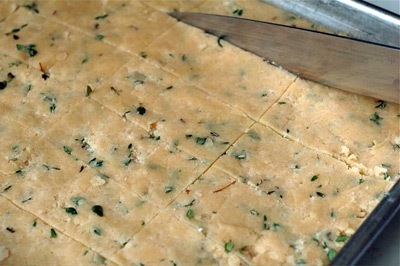 Sprinkle in the thyme leaves and continue stirring until the herb is evenly distributed and the dough is smooth. With a flat or offset spatula, press the dough flat into the sheet pan. Score into evenly sized bars with a sharp knife. Brush lightly with egg white, and then prick each cookie two or three times with the tines of a fork. Bake until golden, 15 to 18 minutes. While the bars are still warm, cut along your previous score lines. Slide the cookies with their parchment paper onto a wire rack and let cool completely. They will continue to crisp, and their flavor will be better after one or two days. Store in an airtight tin, sharing most of them with your friends and saving a week’s worth for yourself. These were so yummy! And a big hit at home and the office. Glad I have the recipe now. Those look fantastic — I’ve got a bumper crop of lemon thyme going, and I’m thinking this might be the ideal use for some of it. Thanks Thy!